NOTTINGHAM’S own Robin Hood helped ‘steal’ the show during a highly successful week at MIPIM – the world’s largest property event held in Cannes last week (13 – 15 March) – which saw Nottingham’s £2 billion programme of strategic redevelopment funded by investors, the council, and partners showcased to more than 30,000 delegates from around 100 countries. Taking its strongest ever team of Nottingham-based businesses and partners, the city displayed a number of key sites across the north and south of the city, including Guildhall Place and the intu Broadmarsh development. One of the biggest announcements came from First Panattoni – the UK development arm of Panattoni Europe and the UK’s largest speculative developer. The firm revealed its plans to create ‘Panattoni Park’ – a speculative build of three warehouse facilities in Nottingham totalling 714,000 sq ft – during Team Nottingham’s prestigious dinner event. Lorraine Baggs, head of investment at Invest in Nottingham, said: “We were thrilled to be able to exclusively reveal this new development whilst at MIPIM. It’s fantastic news for Nottingham and makes us all the more appealing to investors and occupiers. The next stage of the Derby/Nottingham Metro Strategy was also set out at a presentation by Ian Curryer, chief executive of Nottingham City Council. The strategy brings the two cities together to drive economic growth and productivity, improve connectivity and skills levels and deliver efficient city services, ensuring that Derby and Nottingham build their global reputation as an exciting place for investment. Ian Curryer said: “The Metro Strategy aims to harness the potential of both cities and join forces to drive the jobs and prosperity that will fuel the Midlands as an engine for UK economic growth. We have huge opportunities – not least HS2 – which lie within our city-region and we need to collaborate to make the most of them. 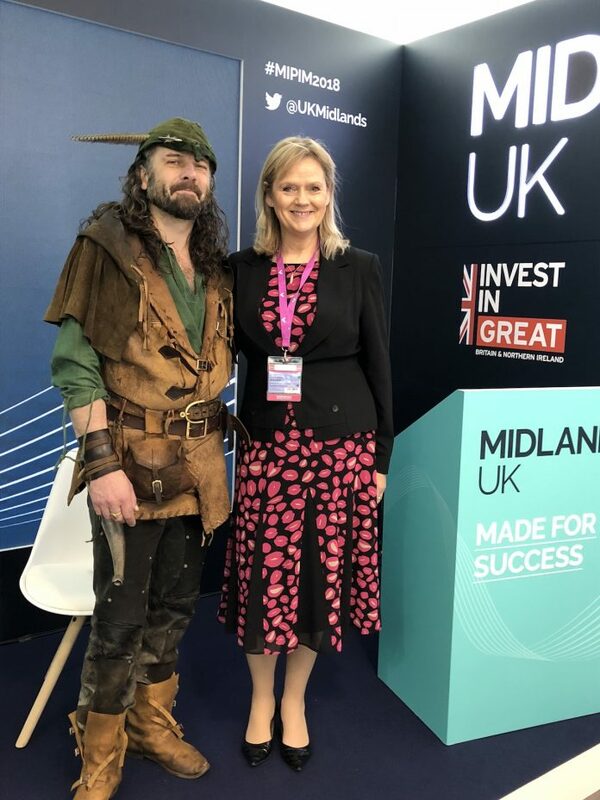 An appearance from Nottingham’s most famous outlaw, Robin Hood, also caused a stir among delegates. Robin joined Team Nottingham for the first time this year, helping to kick off the week and raise awareness of the city’s presence. Lorraine said: “We really upped our game this year in terms of place marketing in the city and promoting inward investment and regeneration. MIPIM is a great place to showcase the significant opportunity there is in Nottingham. Roythornes Solicitors joined Team Nottingham for the first time. Partner Shruti Trivedi said:“It was our first year as sponsors and we are very glad we joined. We can immediately see the nexus especially given our plans for and our recent growth in Nottingham. “We felt we made some useful contacts and are now focussing on effective follow ups so we can capitalise on the initial promising start. Also joining the team for the first time was Paragon Interiors Group. Business development associate Amy Revell said: “Being part of Team Nottingham and the Midlands Pavilion enabled us to understand all opportunities our region has to offer and easily connect our national developer clients into the regional investment teams and key influencers in the cities they are looking to invest and locate. Neil Harrison, associate director at Arup said: “The Midlands Pavilion demonstrated the best of the Midlands and was exemplary at showcasing public and private collaboration. “There is a real sense of business confidence around the Midlands and this created a real buzz inside the Midlands Pavilion. It was great to see Team Nottingham play a significant part in showcasing what the UK Midlands has to offer to the world. Sean Bowles, managing director of Morgan Sindall’s Central Region, said: “The Midlands Pavilion impressed for the second year running, providing the perfect venue to promote the region. Working sustainably, delivering social value, and a focus on skills and talent all featured heavily in the programme – agendas we support wholeheartedly at Morgan Sindall. “There was also real interest in our flagship event on the Thursday: Winning the UK Regeneration Game. I was joined on stage by Marketing NG CEO, Brendan Moffett, along with representatives from Homes England, Liverpool Vision and Slough Urban Renewal.